A View from the Touchline – Premier League: 26.1.19. The grey misty day did not inspire much optimism for loyal travelling Currie supporters, who have experienced disappointment on recent visits to the Greenyards. Adding to the gloom, steady rain started to fall as the match got under way, but any despondency was soon brightened by Currie’s lively play and a superb Gregor Hunter break that took the visitors deep into the ‘Rose 22. Early pressure, with a period of good possession and excellent handling allowed the Chieftains to edge nearer the ‘Rose goal line, but their defensive lock proved difficult to unpick, until some slick short passes made space for Ben Robbins to power in from 15 metres. Gregor Hunter converted. Thomas Gordon, still receiving plaudits following his first outing with Glasgow Warriors, charged at the opposition; for 30 metres he knocked over tacklers as if they were skittles at a bowling alley, but unfortunately, he lost control of the ball when finally floored, though his industry helped to set up another opportunity. ‘Rose were penalised, and Gregor Hunter went for touch. A classic catch and drive could not quite make the try line, but scrumhalf Chris Davies got the ball away to his backs, where Robbie Nelson tanked to within a metre of a try and was eventually stopped with three opposition players desperately hanging on to him. In an effort to maintain their defensive wall, ‘Rose streaked across the pitch, but the astute Chris Davies picked up, and dived over from the breakdown. Gregor Hunter was again on target with his conversion. With twenty minutes on the clock, play had only been in one direction, but there was that feeling that the Greenyards outfit had the ability to turn things around very quickly, and for the remainder of the half they mainly camped in Chieftains’ territory and battered the visitors’ line. Currie defended well with some heroic tackling from Matias Agiro, Michael Vernel, Scott McGinley and Fergus Scott, but when a clearance kick was fielded by Fraser Thomson on half-way, the dangerous fullback whizzed diagonally into open space and started a move that continued down the stand side touchline; it nearly brought reward. The ball was held up, and Currie managed to keep their line intact, but ‘Rose would not release their grip, and the visitors found it difficult to gain possession. With two penalty lineouts and a yellow card, for a no-arms tackle, ‘Rose could still not break through. Finally, after nearly ten minutes of added time, and all but three or four of their team involved in a massive rolling maul, the heap cascaded over the goal line. The first half concluded with Craig Jackson converting the Neil Irvine-Hess try. Halftime score – Melrose 7 pts, Currie Chieftains 14 pts. The ‘Rose score, on the cusp of halftime was no doubt an enormous boost for the home team, who almost certainly would continue in the same fashion as they finished the first half; however, it was the Chieftains who showed early initiative, and within two minutes it looked as if Ben Robbins had scored in the corner. Unfortunately, an alert official flagged for a foot in touch, and play was called back. Currie continued to apply pressure with Marc Kelly, Fraser Watt, and Matias Agiro carrying the ball agonisingly close to the line. For their efforts, the visitors did gain a penalty goal after ‘Rose had handled at a breakdown under the posts; the kick was a formality for Gregor Hunter. continuously bombarded them with long speculative kicks, which allowed ‘Rose to keep searching for mistakes and gaps; very few came. As the light dimmed, and the match wound into its final quarter, the tension became pulpable with only a single score separating the two sides. Defensive honours were about equal, but Currie looked sharper in attack with the ball reaching both wings as they put several phases together. Once again it was the awesome power of Robbie Nelson that caused anxiety in the ‘Rose back-line; like a magnet, he engaged several defenders, and although his pass did not directly reach Matthew Hooks on the wing, the Irishman was quickly onto the ball, and as if by magic, he slipped, hopped, skipped and danced out of tackles on his twenty metre jaunt to the line, leaving a trail of prostrate bodies behind him. Gregor Hunter maintained his immaculate kicking with a difficult conversion. The air was electric; with barely ten minutes remaining ‘Rose went into overdrive as they opened a box of skills in desperation of at least a losing bonus point. Yet another long hanging ball was pumped into the Chieftains’ 22; this time the recipient was Joe Reynolds, who, as he can do in an instant, sized the situation and accelerated through a gaggle of ‘Rose players into space. He straightened his run with twenty-nine runners in pursuit, but just as he was caught, the perfect pass went to Vince Wright, who miraculously, still had the energy to motor the remaining twenty or so metres for the goal line. 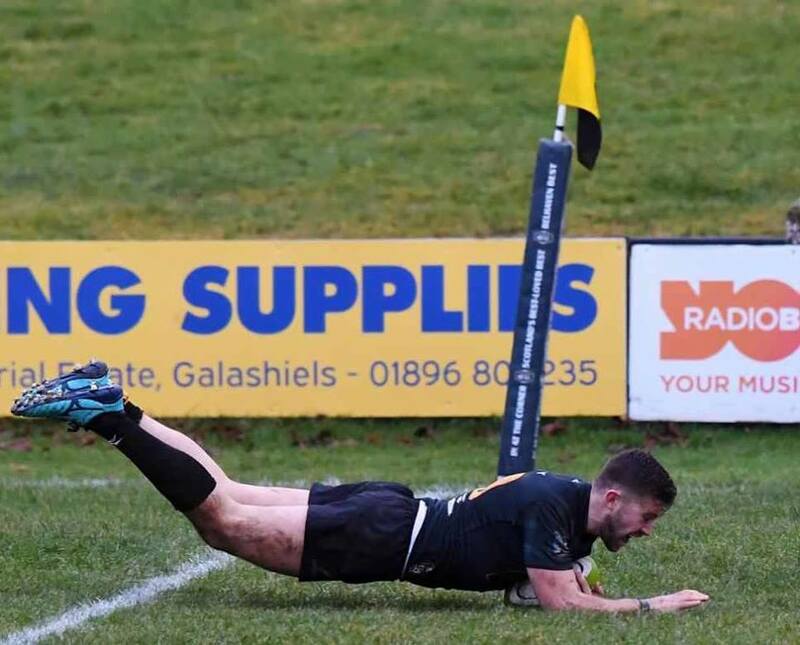 What a score, and what a conversion from the boot of Gregor Hunter. The home crowd were stung into silence, but the visitors’ shouts of joy would have been heard all over the Border hills. This was an outstanding team performance, and even without the bulk of Kiran McDonald, who had to retire injured mid-way through the second half, the reshuffled pack coped admirably, as bench replacements Marc Kelly and Rhys Davis demonstrated. Praise must also go to Chris Davies playing out of position at scrumhalf; his steady no-frills performance was capped with a try of which any scrumhalf would have been proud! Jamie Forbes and Gregor Hunter maintained their high standards, another reason why they, along with Robbie Nelson and Thomas Gordon have been selected for the Scotland Club team to play their Irish counterparts next week. 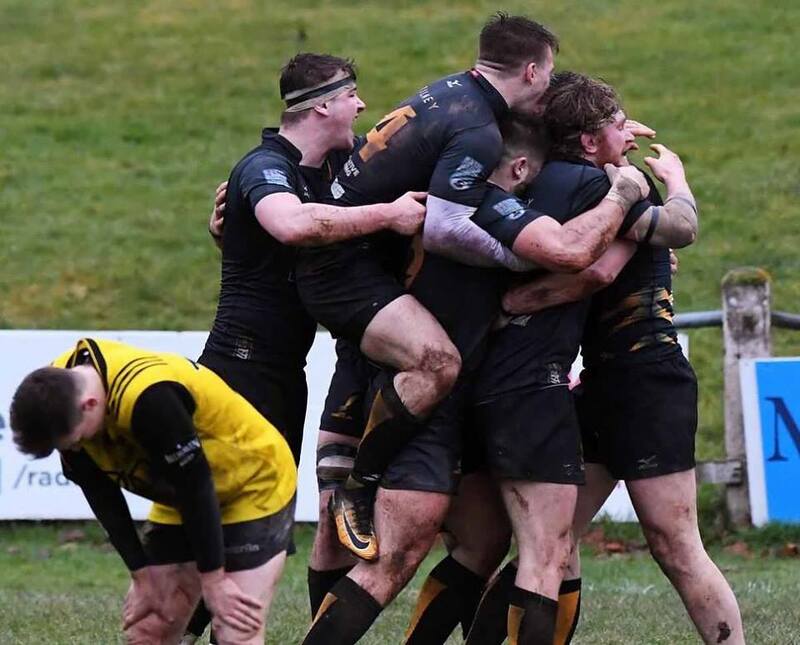 The Chieftains are now guaranteed a top four finish and play-off spot, but with one remaining fixture on Saturday, March 2nd against Edinburgh Accies at Malleny Park, a bonus point win is required to ensure that the semi-final match will be played at home. There is now the annual contentious gap in club fixtures as the Six Nations Championship gets underway. The Chieftains next match is in the National Cup at Ayr on February 16th. If you cannot travel, there is Chieftains ‘A’ match at Malleny Park on the same day when they entertain Kelso in a Reserve League fixture, KO time 2.00 pm. I.J.S, 27.1.19. Currie Chieftains Team v Melrose – 26.1.19. 5 Kiran McDonald, 4 Vince Wright, 3 Fraser Watt, 2 Fergus Scott, 1 Matias Agiro. 16 Graeme Carson, 17 AP McWilliam, 18 Marc Kelly, 19 Rhys Davies, 20 Matthew Hooks.